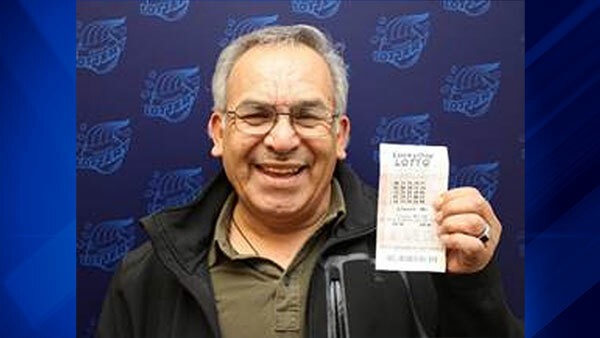 CHICAGO (WLS) -- O'Hare International Airport employee Jose Martinez, 61, won a $700,000 jackpot on a Lucky Day Lotto ticket purchased at the airport. Martinez, who lives in Hammond, Ind., purchased his winning ticket at the Paralyzed Veterans of America kiosk in Terminal 2. "When the clerk told me I won the jackpot I started shaking," he said. "I couldn't hold the phone straight to dial my wife's number to tell her the news!" Martinez and his wife plan to share the prize with their four children and 10 grandchildren, and to buy a new house. He said he plays Lucky Day Lotto two or three times a week.